UPDATED: Mon., Feb. 11, 2019, 12:36 p.m.
PULLMAN – A historic road sweep led to some rare weekly awards for the Washington State men’s basketball team. Robert Franks, who poured in 65 points and pulled down 22 rebounds during the Cougars’ wins at Arizona State and Arizona, was named the NCAA.com National Player of the Week and the Pac-12 Player of the Week Monday morning. The Pac-12 award is handed out weekly throughout the three-month long regular season, but it’d been more than three years since a WSU player was recognized. Franks became the first since former Cougar forward Josh Hawkinson was honored in 2015. 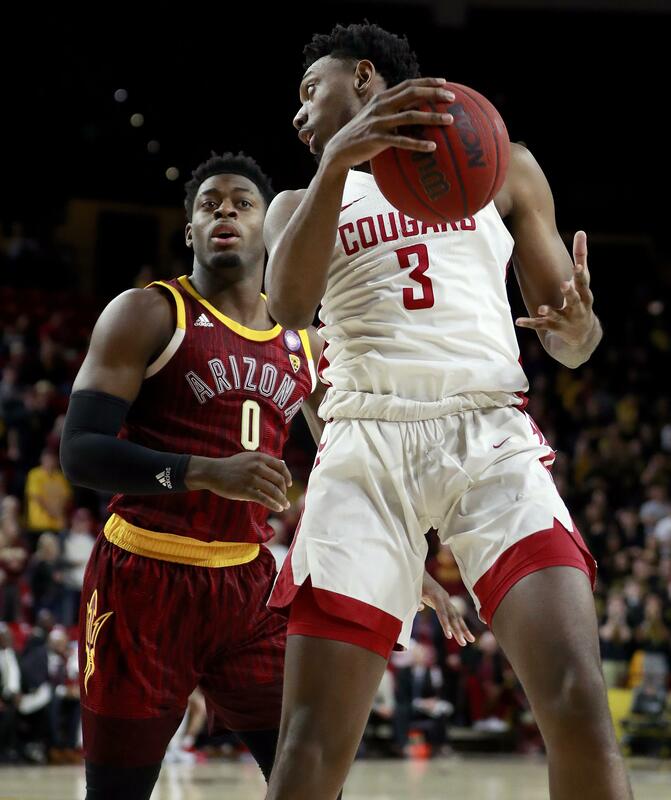 The Cougars hadn’t won consecutive Pac-12 games on the road since 2009 and not since 1994 had a team from the conference swept Arizona State and Arizona. Franks tied his career-high, scoring 34 points on 11-of-17 shooting from the field in WSU’s 91-70 win over the Sun Devils. He made 5-of-9 3-pointers in the game and all seven of his free throws. Franks also had 13 rebounds, four blocked shots, four steals and two assists in he Cougars’ first road win of the season. Two days later in Tucson, the senior forward from Vancouver again was 11-of-17 from the field, but finished with 31 points and nine rebounds in a 69-55 win over Arizona. He was 7-of-9 from beyond the arc and dished out two assists. Multiple 30-point games bumped Franks’ Pac-12-leading scoring average to 22.6 points-per-game – more than two points higher than Oregon State’s Tres Tinkle. Franks has scored at least 20 points in four of his last five games and now has four 30-point games on the season. He’s also top-five in the league in rebounding, checking in at No. 5 with 7.7 boards per game. Published: Feb. 11, 2019, 12:19 p.m. Updated: Feb. 11, 2019, 12:36 p.m.